An Urban Teacher's Education: The Powerful Poor? Introducing a book on educational organizing, Fabricant has little choice but to contextualize his greater narrative by briefly acknowledging the negative impacts of neoliberal policy and standardized testing on educational reform, historic failures to realize meaningful solutions in New York City (highlighting the Ocean Hill-Brownsville debacle), and the daunting challenges that accompany any efforts at real reform in disadvantaged neighborhoods. In spite of these challenges, one group of parents and organizers, known as the Community Collaborative to Improve District 9 Schools (or CC9), managed to steer NYC's major stakeholders toward positive change. CC9 (which later turned into the Community Collaborative to Improve Bronx Schools, or CCB, and then joined the NYC Coalition for Educational Justice, or CEJ) was a coalition of parents, community-based organizations, and NYU's Institute for Education and Social Policy. It was organized around an understanding of local schools as a persistant barrier to community revitalization, and its mission and practice (which seem to have been primarily, although far from exclusively, the brainchild of Eric Zachary, an organizer at NYU's IESP) focused not only around parent involvement, but parent voice and direction setting. CC9's most notable achievement was the hiring of thirty-six lead teachers in ten CC9 schools over the summer of 2005 at a cost of just under $2 million (primarily funded by the DOE and marginally funded by foundations). Lead teachers are experienced teachers who are paid more to come to struggling schools and given release time to mentor novice teachers. The initiative became part of the DOE's citywide agenda and was associated with positive student achievement data. The lead teacher campaign, while the focus of the book, was not CC9's only success. It also fought and won to keep its member schools within the same cluster during the 2002-2003 school year, when the DOE was proposing to reorganize schools into clusters. This battle, while seemingly not-so-significant, had an enormous impact on CC9's future operating capacity. The DOE's move to reorganize schools into regions and allow students to attend schools far from their neighborhoods (while providing some students an opportunity to avoid a poor-performing school) greatly diminishes the opportunity for community involvement. If your child attends school in another borough, it's unlikely that you're as familiar with the school's community organizations or encounter his/her peers' parents on a day-to-day basis outside of school. This makes it increasingly difficult for parents to organize around local school reform, which can be seen as a subversion of the democratic process. CC9 also managed to install speed bumps in front of some of its schools, but that effort seemed more of a side note in the grand scheme of CC9's ambitions. Indeed, Fabricant points out repeatedly that safety was, and is traditionally, the primary initial concern among parents from low-income communities. Parents from these communities are often less concerned with many of the more 'invisible' components of school workings - e.g. classroom instruction, school culture, or assessment practices. Given this reality, it seems unlikely that the lead teacher campaign was driven solely by parents, although Fabricant doesn't come right out and say it. Fabricant does note, more than once, that the lead teacher initiative was politically opportune; it was a venture both the DOE and the UFT were simultaneously interested in as CC9 was gaining power. And with parent focus on safety and facility issues, one suspects organizers played a significant role in introducing parents to and informing them about the lead teacher opportunity. Sustaining itself during its organizing work proved an incredible challenge. The tenets of practice that allowed CC9 to do this included providing dinner and day-care services for mothers who would otherwise be unable to attend meetings, increasing the availability of public space for community dialogue, harping on reasons for moral outrage at deplorable public policies and services, investing time for the building of relationships and familial ties among participants, the training of parents in professional issues as well as the expectation that parents take leadership roles and speak at public events, and encouraging humility among all members (organizers, university staff, and parents) by expecting everyone to admit fault and mistakes. 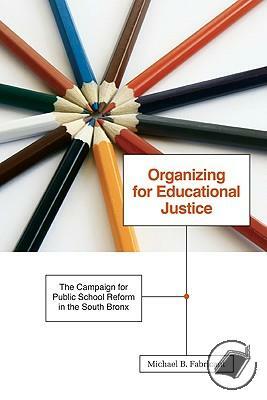 Organizing for Educational Justice shifts between an analysis of the formation and practice of a deeply democratic organization that happens to address educational inequity and a story about school reform that happens to utilize democratic practice as its vehicle. While CC9's ability to sustain itself is more germane to the former, the lessons from CC9's ability to effect change will be of significant value for those most interested in the latter, like me. Fabricant emphasizes and reemphasizes the role CC9 reserved for collaboration in the change process. CC9 leaders did not publicly demonize DOE officials or castigate school staff for poor student achievement. Rather, CC9 formed alliances with multiple community partners, including the UFT and political leaders. It engaged in ongoing dialogue with the DOE, both publicly and privately. And perhaps most critically, it built a base of power outside of the school (primarily through the organization of parents) necessary for holding policymakers accountable, which it gently reminded the DOE could be used for confrontation if necessary. It is from this vein of the book's analysis that I think those of us concerned with improving schools might learn the most about effective methods of advocating meaningful change. I found CC9's succeses to be simultaneously encouraging and discouraging. While a nearly $2 million change in policy is an exceptional accomplishment on behalf of low-income parents, it is a far cry from the organizational overhaul so many inner-city schools need to close the debilitating achievement gap. Furthermore, I am somewhat suspect of the difference that CC9 actually made in instituting the lead teacher campaign. Fabricant notes on a number of occasions that, of the issues CC9 could have advocated around, lead teacher reform was the low-hanging fruit. Both the DOE and the UFT were already interested in seeing it implemented. While it seems obvious that CC9 played a role in the timing of its implementation, I wonder whether it would have been implemented eventually anyway. Additionally, CC9 suffered from numerous challenges, the likes of which would play a major role in any organizing campaign's ability to impact change. Organizers from local organizations were poorly trained, poorly supported, and poorly paid. As a result, the positions turned over at an alarming rate, and many went unfilled for long periods of time. Parents came and went, and many constantly sought opportunities to flee the community as soon as they got an opportunity. The process of dialogue and consensus building was extraordinarily slow, and although many experts emphasize this as an enduring quality of real democratic efforts, the pace leaves me wondering if real democratic change can ever be achieved in communities of such high transiency and high barriers to participation. In the end, I am forced to wonder if CC9's greatest achievement was in transforming the lives of those women who became its parent leaders. Fabricant acknowledges the incredibly stressful lives led by many of the women who came to speak at and organize CC9 functions. Many who were either currently in, or just leaving, abusive relationships testified to the organization's role in providing them not only a sense of identity, but a sense of power and ownership over their lives. Their journeys into the world of democratic participation and leadership are certainly inspiring, but, tragically, I'm afraid they may not be enough to serve as the necessary catalyst for educational change in disadvantaged communities. Fabricant presents the reader with a sobering reminder of the immense complications that come with organizing attempts. And while the book unquestionably provides both a valuable glimpse into the world of democratic organization and an instructive analysis of the nocuous policies that affect the urban poor in light of a somewhat encouraging effort at reform, CC9's struggle is a struggle that I'd prefer to understand as an early experiment in 21st-century democracy in urban America rather than a model. While CC9 certainly employed a number of noteworthy practices that should be emulated, it is obvious that change that is to come from outside the system (as it must), will have to draw on a significantly larger network of change agents if it is to ever gain the political leverage necessary to combat the destructive effects of standardized testing and privatization being disproportionately inflicted on poor and minority children locally or nationwide. Read the book for incredible insight into what real democracy takes and a wealth of opportunities for critical thought, but don't expect a panacea for our urban schools - even Herculean efforts at deep democracy, it appears, are not yet capable of that. I don't know if the book mentions Herb Katz, long-time District 9 representative of the UFT, but he worked closely with CC9 and it was truly in the spirit of collaboration. I had the opportunity to work with them as well, though in a smaller capacity, back in 2003-2006 as district representative of the Bronx high schools. They really cared about the schools in their communities and sought change in a way that was inspirational. Sad to note that today's DOE seems so impervious to voices of the community. The book does mention Herb Katz on more than one occasion as someone who was instrumental in forging the bond between the UFT and CC9. He told me Teaching was "traveling, tenure and the TDA." He made racist and unkind comments about the children who went to the schools in District 9. He said it is the most corrupt and worst District in the entire state. The very worst Math and Reading scores....any truth to this? I had the opportunity to talk to Herb Katz regarding the delineation of curricula and syllabi. What is the ethical responsibility of the DOE to document the delineation of curricula and syllabi? What about...after the school year? What record remains of what was tauaght? Also, personnel guidelines for the potential conflict of interests between administrators and union delegates they may supervise as Teachers. Trying to locate the governmental report and direction to close C.E.S. 104, an elementary school in CC9. Did Herb Katz operate business of tax preparation at the work site while serving as UFT Representative? Was he able to argue against Teachers at a Step II? Would he ever address allegations of a conflict of intersts between UFT Officers and officers of the NYC DOE? Did he truly look down upon the community of CSD 9 as corrupt, illiterate, pagan and low life?